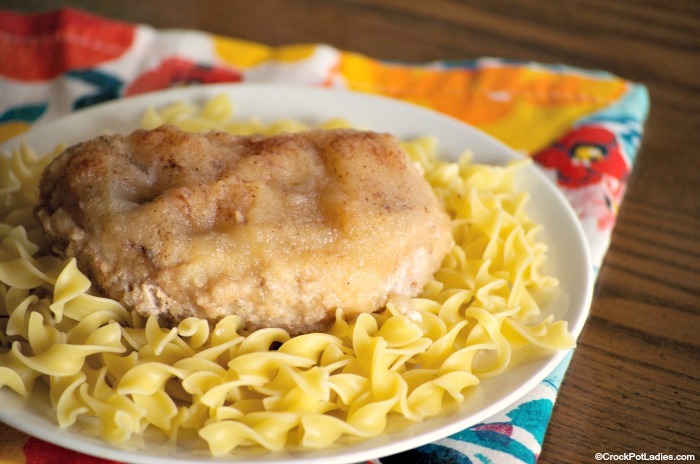 Crock-Pot Applesauce Pork Chops was a recipe that came together because I had a huge tray of pork chops that needed to use up, and applesauce in the cupboard I had made back in the summer 😀 . This is often my way of narrowing what to make for dinner for my family by going with what people have thrown in the fridge. The final result was a super moist, sweet pork chop that the family really enjoyed. 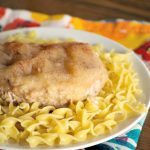 I served the tender pork chops over egg noodles that I had cooked on the stove-top with some of the cooking liquid spooned over the top. Cooked rice would work too! You can use either bone-in pork chops or boneless pork chops in this recipe, both work great. Just look for a medium to thick cut pork chop as thin cut pork chops may dry out in this recipe. However, if all you have on hand is thin cut pork chops just reduce the cooking time so as to not over cook your pork chops. The super fun part was I got to use my new slow cooker for the first time. I had a slow cooker that I’ve owned for about 7 years and the handle was falling off, and another one that bit the dust when one of my children dropped it. So I was running out of them, and for someone like me that is a big deal! I received this Stainless Steel 6.5 Quart Programmable Touch Screen Crock-Pot for my wedding anniversary and it’s been a great addition to my slow cooker repertoire. I have had no issues, and it my biggest crock yet (which I’ve really needed). 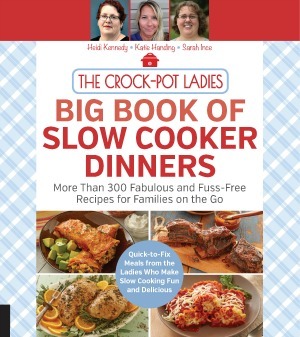 So if you are looking at purchasing a new crock, I can definitely endorse that one as a nice quality slow cooker! 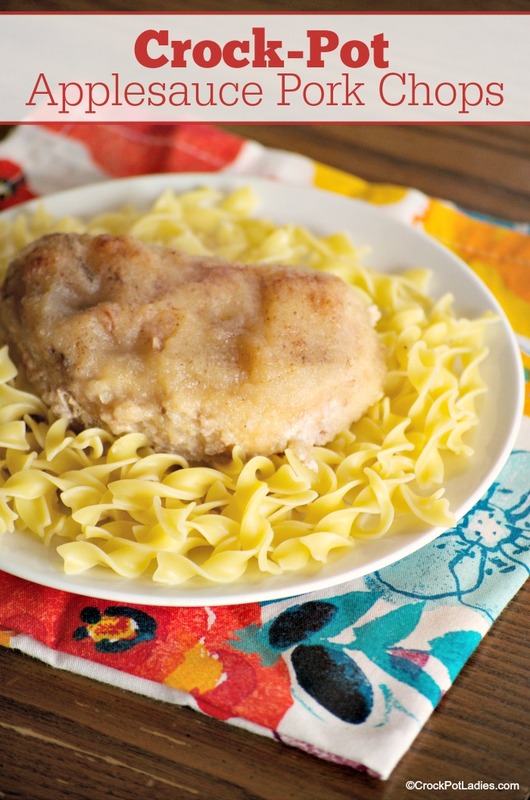 With only 4 ingredients (plus salt and pepper to taste) this easy pork chop recipe combines tender and moist pork chops with applesauce, ginger and onions for a tasty entree everyone will love! In a 6 quart or larger slow cooker place a crock-pot liner or spray with non-stick cooking spray if desired. Lay half of the pork chops in the bottom of the slow cooker season with half of the minced onions, salt, pepper and ground ginger. Cover the pork chops with 1 cup of the applesauce. Add another layer of pork chops and sprinkle the other half of the minced onions, salt, pepper, and ground ginger. Spread the other cup of applesauce over the pork chops. Cover and cook on LOW for 7 to 8 hours on LOW. Serve over cooked rice or pasta if desired. How would I go about making this recipe a freezer meal? Hi Nancy, this recipe is not one of our freezer meal recipes but upon looking at it further I don’t see why it wouldn’t work by just tossing all the ingredients in a freezer bag and freezing it. Just be sure to thaw the freezer meal before putting in the slow cooker! I used boneless butterfly pork chops, which were about 1/2 inch thick. I think the cooking time could have been dropped to 5 hours on low, as I noticed the liquid was on a slow boil the whole time. I did 6 hours and they were well-cooked bordering on over-cooked, but all the juice kept them moist. I threw in some baby carrots and dried cranberries for the last hour and the kids gobbled it up. I think the leftovers will taste even better the next day.